Hotel Sara is located in the old city center and also five minutes walk from Mother Teresa square. The hotel consists of 33 standard rooms, jacuzzi rooms, apartments and suites. All rooms are equipped according to the standard rules. There is a parking which is monitored by a security system 24/7. And last but not least the hotel has 70-year tradition. Our vision is to be one of the best hotel in Kosovo and to give our costumers an unforgettable stay. Hotel has 33 rooms, single rooms, double rooms, apartments and suites.The endowment is special and decorated with good taste. All rooms are equipped with bathroom shower cabins/tubs, TV, telephone line, free Wireless, some with balcony. Comforts join the refinement and good taste. 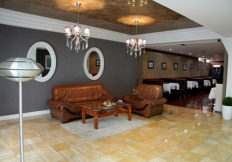 Hotel Sara offers you a nice ambience, faultless serving and accommodation. 24 hour room service, parking, transfer from airport, elevator, conference hall, laundry service, ironing table, 24 hours security, lobby, free Wi-fi. Check in is at 12.00 o’clock and check out is at 12.00 o’clock.